Dramatization of events in this post for the video game-derived film Assassin’s Creed: Lineage. On this date in 1477, the assassins of the Duke of Milan suffered bitter death for fame eternal. Famous for both his astute political machinations and for cruelty verging on the sadistic, Galeazzo Maria Sforza inherited leadership of Milan in at the age of 22 with the passing of his father, the great condottiero Francesco Sforza. Francesco, the founder of the Sforza dynasty, had dynastically married himself to one Bianca Maria Visconti, a daughter of Milan’s previous ruling house. * But not all of the Visconti were at home with the Sforza. A brash young man of that noble family, Carlo Visconti, as full of humanistic idealism as he was of bile for the licentious Duke’s alleged violation of his sister, joined a conspiracy also compassing two other gentlemen, Giovanni Andrea Lampugnani and Gerolamo Olgiati, to do Galeazzo Sforza to death. At a St. Stephen’s Day service in a basilica christened to Stephen Lampugnani approached the prince feigning supplication for some audience, then produced a hidden blade and stabbed Galeazzo Sforza. Visconti and Olgiati then rushed on Sforza as well and before anyone realized what was happening the Duke, croaking some half-heard invocation of Mary, was falling dead on the church floor. 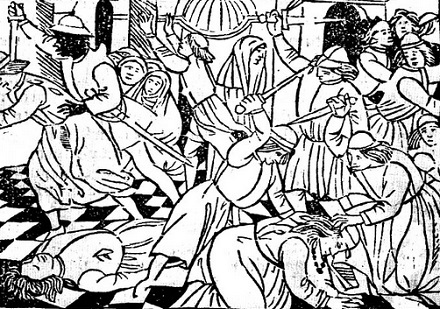 Illustration of Galeazzo Sforza’s murder on the title page of a 1476 Lament for the Duke decrying the assassination. The assassins of the Duke of Milan appear not to have burdened themselves overmuch with advance consideration of this danger, possibly indulging the dream of Brutus that by a dagger’s stroke alone they could restore the lost republic. Needless to say, this beautiful hope vanished in the bloody revenge carnival that actually ensued the murder. Just a few days after the assassination, having taken refuge with a priest — his justly frightened family had closed its door on him and needed to make theatrical denunciations of his treason for their own safety — Olgiati was captured, put to a torturous interrogation, and publicly butchered. He had outlived the Duke by only a week, and his gashed carcass was hung up in sections around town by way of warning. The rotting heads of the conspirators remained impaled on lances on the city’s bell tower well into the 1490s. This attempt, quixotic and doomed, to depose an Italian tyrant by murdering him in church might well have formed the blueprint for a similar plot in Florence in 1478, the Pazzi conspiracy. That version was even less successful than its Milanese predecessor: at least Olgiati and company could say that they actually managed to kill their target before everything else hit the fan. And republic or not, Sforza’s murder did shake up the polity. It put the Duchy of Milan in the hands of his wife, as the unsteady regent of a seven-year-old heir. A few years later, the late duke’s brother Ludovico displaced the regent and effectively bossed Milan until the French imprisoned him in 1500 during the Italian Wars. While he had the run of the place, Ludovico Sforza commissioned of Leonardo da Vinci a monumental equestrian statue in memory of his brother that da Vinci never finished.† Quite strangely, the master’s notes were plumbed by a 20th century Pennsylvania airline pilot who dedicated the latter part of his life to actually casting “Leonardo’s Horse”. * The names Visconti and Sforza are also associated with some of the earliest tarot decks and among the first to introduce to playing cards the use of trionfi, or “triumph” cards — that is, “trumps”. One can readily purchase present-day reprints of this historic pack. ** There is a positively maddening inconsistency, thus far irresolvable for this author, between accounts (here’s one example | and another) asserting that Carlo Visconti was slain by Sforza’s bodyguards directly after the assassination, and other accounts (like Gregory Lubkin’s 1994 history of Sforza’s Milan) that put Visconti on the scaffold beside Olgiati. † Da Vinci’s ponderously slow progress on this high-profile project led Michelangelo to cattily impugn the rival artist’s bronze-casting aptitude. 1536: Sebastiano de Montecuccoli, poisoner of the heir?